Golden X Casino, brought to you by NovomaticCasino.co.uk is a retro, fruity slot with something extra special up its sleeve. This 4-reel slot has a totally cheesy, 70s vibe and is packed full of familiar symbols and comes with evocative sound effects and music. The symbols include all of the well-known fruits, as well as a lucky 4-leaf clover, a generous red star and green bar and a precious, golden bell which, if you spin 4 of these valuable bad boys, you’ll times your bet by 100! Talk about lucrative. This NovomaticCasino.co.uk slot is fantastic for fruity slot fans, especially those who are already players of Fruit Fall, Fruit Fest and Golden Sevens. Not only that, but slots experts who want to get back to basics and have some old-school fun will really enjoy this game, as will anyone who’s new to the world of online slots as Golden X Casino is just the right mix of simple and fun! At the bottom of the screen you’ll always be able to see your bet amount, in the middle, with your balance on the left, and your winnings on the right. You can change your bet amount at any time, by using the plus and minus symbols to either side, and you can consult the paytable whenever you need, to see how much each symbol pays out, depending on your bet, and also if you need some help with understanding the game or any of its features. Just like the majority of NovomaticCasino.co.uk games, you can play Golden X Casino for free until you’re ready to start betting and winning with real cash! When you feel as though you’ve got the hang of it, and you’re comfortable and confident in the size of your bet, you can click ‘autoplay’. When the game is in autoplay mode, it will spin the reels for you and you needn’t do a thing – you could even get on with that chore you’ve been meaning to do all week! 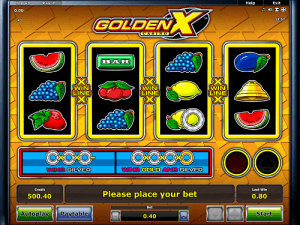 Golden X Casino also has a familiar ‘gamble’ feature which you can use when the game isn’t in autoplay. Each time you get a win, you have the chance to double it, again and again! In this slot, you have to choose correctly between the red heart and the black spade. Keep guessing right and you’ll keep doubling the amount, but guess wrong and you’ll be back to the reels with nothing! The best thing about this game hasn’t even been mentioned yet! Can you believe it? Golden X Casino has two extra symbols which can stick to the others: the silver disc and the golden disc. If three of these silver discs fall on the first three reels, from left to right, the silver Golden X Casino wheel will appear and fill your screen! When this happens, you need to stop it from spinning and whichever number it falls on will be the multiplier for your win! If a fourth disc, the golden disc, falls on the fourth reel then the golden wheel will spin as well, and you’ll have to stop that too – and the multipliers on the golden wheel go all the way up to x20! NovomaticCasino.co.uk has many other slots and video slots which will appeal to fans of Golden X Casino, such as: Fruit Fall and Ultra Hot Deluxe. We also have a vast array of table games and live dealer games, which offer fantastically high RTP (return to player) percentages. It’s always good to try something new once in a while. Why not try your luck at Sic Bo or Roulette? Or, if you’re looking for something more glamourous then give Live Blackjack or Live Baccarat a go and you’re sure to feel as if you’re right there in the middle of the most lavish casino you can imagine!